Electronic legend deadmau5 (né Joel Zimmerman) is stripping down his sound and adding string instruments to his army of synths for a Tidal X-sponsored concert titled “where’s the drop?” next month. Tidal subscribers can jump in on today’s pre-sale, while the general public will be able to buy tickets starting tomorrow. The concert takes place April 1st at Los Angeles’ historic Wiltern Theater. In case you forgot, deadmau5 himself is a one of the service’s artist-owners, along with Jay Z, Jack White and Daft Punk. If you can not make it to Los Angeles for Easter, the show will be streamed through Tidal that day as well. On the Friday prior (March 30th), Deadmau5 will be releasing a Tidal-exclusive studio album by the same name featuring 17 orchestral reimaginings of his songs. The concept originated during one of the producer’s Twitch streams, where Zimmerman met Hollywood composer Gregory Reveret, who will be handling orchestration duties for the show and album. Considering how much the producer leans on high-tech production for his stage shows and recording — like mixing his most recent album for Dolby Atmos — it’ll be interesting to see and hear how this differs from the typical deadmau5 experience. Beyond the Wiltern, deadmau5 and Reveret entered famed EastWest Studios to record 17 orchestral songs which will appear on the album version of where’s the drop? set for release March 30 exclusively on TIDAL.com via deadmau5′ imprint mau5trap. Knowing how crucial it is for the lagging streaming service to gain new subscribers, it is no wonder that Tidal is attempting stunts like these to attract enough customers, hopefully to keep the lights on. 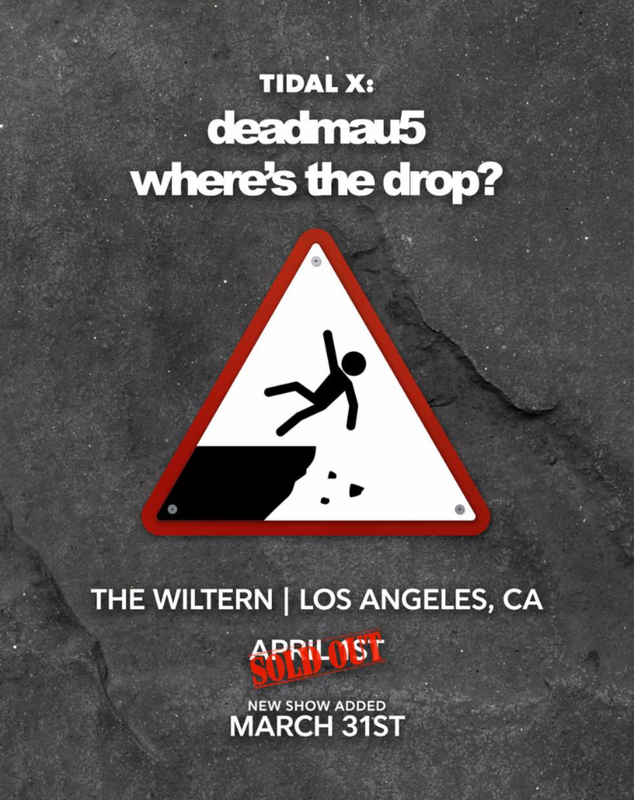 UPDATE (3/8): A second show has been added for the special “where’s the drop?” performance. The new show will take place at the same location on Saturday, 3/31.